CIRCA 1919 - General Ely reviews troops in France. hd00:35CIRCA 1917 - Generals Pershing and Joffre leave a field of US Marines in a car. hd01:07CIRCA 1920s - Cannons and other field artillery are shot at the Aberdeen Proving Grounds. hd01:23CIRCA - 1918 - Teams finish a race carrying artillery equipment with gas masks on during WWI. hd00:24CIRCA 1910s - Officials of the Allied Expeditionary Forces pose for a picture, and servicemen march in formation in Siberia. hd01:19CIRCA 1919 - American soldiers play sports in the snow while stationed in Rauchbach, Germany. 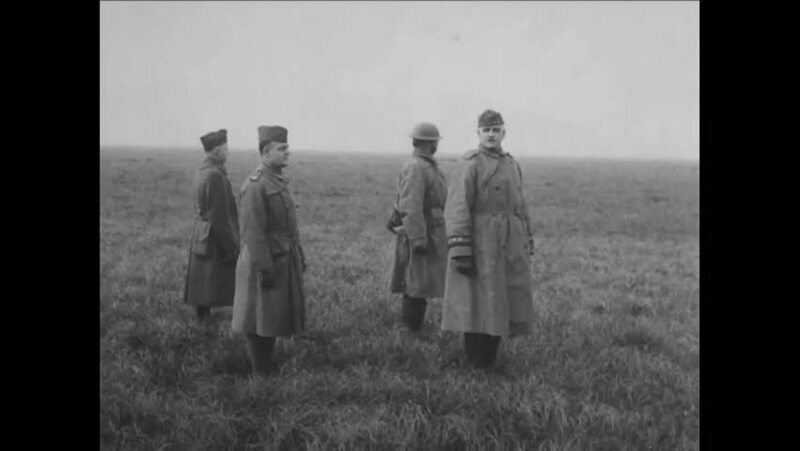 hd01:13CIRCA 1918 - Soldiers train with gas masks and rifles in a field in the Puvenelle Sector of France during World War 1.
hd01:35CIRCA 1918 - General Hunter Liggett, General John Pershing and Secretary of War Newton Baker review the 16th and 17th Infantry units in Gondrecourt, France, during World War 1.